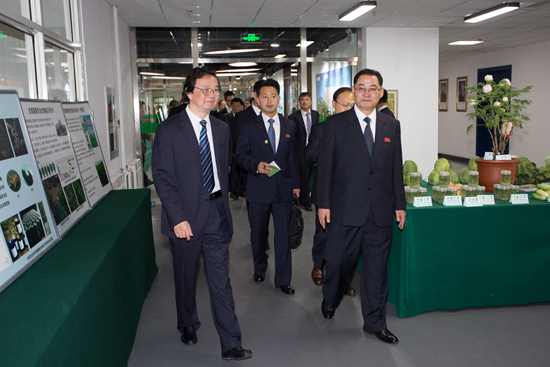 On May 15, a delegation led by Mr. Park Tae Sung, member of the Political Bureau of the Central Committee of the Korean Workers Party and Vice Chairman of the Central Committee, visited the Institute of Crop Sciences of the Chinese Academy of Agricultural Sciences (CAAS) and the National Modern Agricultural Science and Technology Demonstration Park. Mr. Wang Yajun, Vice Minister of the International Department of CPC Central Committee, Prof. Tang Huajun, a member of the CPC Leading Group, Ministry of Agriculture and Rural Affairs and President of CAAS, and Prof. Wu Kongming, Vice President of CAAS, accompanied the visit. During the visit, Prof. Wu Kongming briefed the delegation on the layout of the institutes of CAAS, the research disciplines, and achievements in basic and applied researches. He also introduced the history of collaboration between CAAS and research institutes from D.P.R. 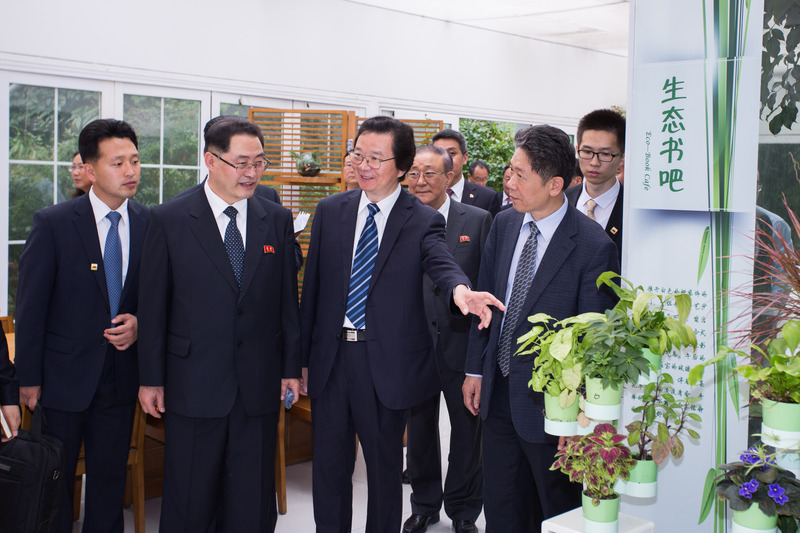 Korea in the field of agricultural science and technology. Prof. Liu Chunming, Director General of the Institute of Crop Sciences (ICS) of CAAS; Prof. Sun Rifei, Director General of Institute of Vegetables and Flowers (IVF) of CAAS; Prof. Zhou Xueping, Director General of the Institute of Plant Protection (IPP) of CAAS; and Prof. Dai Xiaofeng, Director General of the Institute of Food Science and Technology (IFST) of CAAS, respectively introduced the accomplishments in agricultural science and technology in the fields of crop cultivation, germplasm conservation and utilization, vegetable and flower varieties, landscape design, biological control, green safe production, agricultural processing. Prof. Wei Lingling, who is in charge of the National Modern Agricultural Science and Technology Demonstration Park, introduced the Park’s intelligent control technology, LED plant factories, soilless cultivation, vertical farming and technologies and application demonstrations. In his comments, Mr. Park Tae-sung expressed hope to continuously consolidate the traditional friendship and further strengthen cooperation between the D.P.R. Korea and China in agriculture sector, and jointly improve food security and sustainable agricultural development.